Sunday night’s Golden Globes came after a whirlwind four months for the cast and crew of Atlanta. The FX show won Best TV Comedy Series for its first season, and Donald Glover, the show’s star (and creator, and co-writer, and sometimes director, and executive producer) won for Best TV Comedy Actor. As they took the stage to accept their awards, there seemed to be a genuine excitement and shock — not that they had any doubts about the show’s quality, but because it still feels surprising to see a show of Atlanta’s nature, inventiveness, and hue be acknowledged. There’s never any way to predict how critics or viewers will respond to a show before it airs, but Glover and the makers of Atlanta knew they had something special. Last August, I went to L.A. to interview Glover for a New York profile, and spoke to him at his brother Stephen’s apartment in Hollywood. 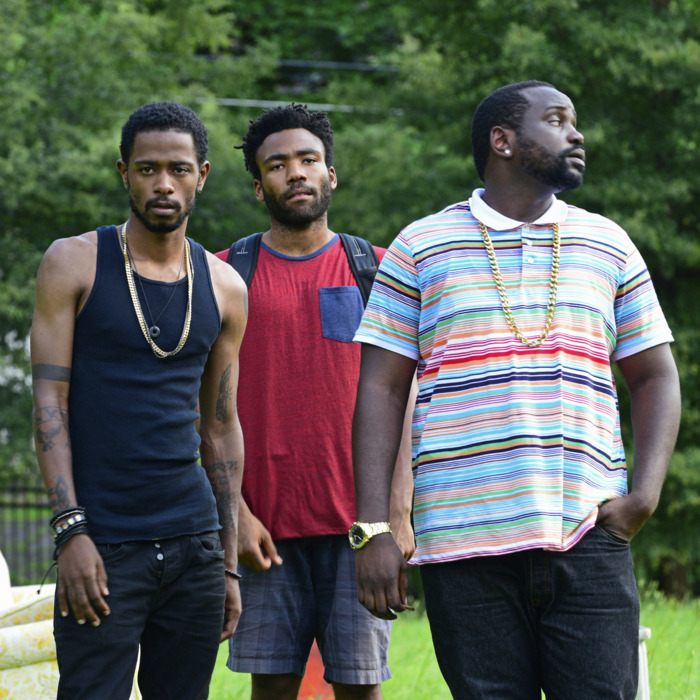 Even though the show’s very first episode wouldn’t premiere for another few weeks, Glover told me, calmly and confidently, that “the second season of Atlanta will be a classic.” The second season. At that point, I’d only been given a few advance episodes of season one to watch, but his declaration made me very excited to see the whole thing. As I was leaving, Donald told me that a few people might come by Stephen’s apartment the following night to hang out, and if they did, he’d let me know. The next day, I ended up attending what turned out to be an intimate Atlanta viewing party for the show’s cast, director, and writers, as well as a few friends. For the occasion, couches were arranged in an L-shaped formation, with a few extra chairs around for additional seating. Boxes of pizza shared the coffee table with handles of whiskey, and there were bottles of Guinness and cans of Tecate in the fridge. When I arrived, Donald was on a couch, along with Atlanta writers Jamal Olori (a.k.a. Swank), Stephen (Atlanta’s story editor) and Fam Udeorji (who is also Donald’s manager), plus Hiro Murai, who directed seven of the first season’s ten episodes. A few minutes later, Keith Stanfield, who plays Darius, walked in as I grabbed a beer out of the fridge, and after him, Brian Tyree Henry, who plays Atlanta’s Alfred “Paper Boi” Miles, in the classic Atlanta Braves “A” hat. There was a nervous energy in the room as Stephen queued up five episodes, from both the spectators and those involved in the show. Few had seen the season in its final form, including actors in the room. As we watched, Brian was the most animated, quietly giggling at his own jokes and loudly laughing at others. During a few of their scenes together, he lunged to hit Keith on the leg or arm and said, “You killed that!” The room could barely contain itself during the season’s most inventive episode, “B.A.N.,” in which Paper Boi debates a critic and Don Lemon–esque host on a talk show. And the next episode, “The Club,” which ends with an invisible car plowing through a parking-lot crowd, sent everybody into one of those there’s not enough oxygen in this room to breathe, I’m dying, I’m dead laughs. Keith asked Stephen to play the car scene again, and it got even bigger laughs the second time. Brian, who said he hadn’t seen how the season ended, was visibly moved by the last scene of the season finale — in which Donald’s Earn returns to his storage unit/home while “Elevators” by Outkast plays — sitting completely silent and still. When it ended, he led the room in applause, with everyone excitedly dapping up Donald and Hiro. Donald had been a little reserved most of the evening, but even he couldn’t contain his excitement, everyone else’s joy proving contagious. It was a real joy to be a fly on the wall and watch those involved realize they’d made something great.